As a Las Vegas Website Design Company we like sharing tips to help you improve your online business and brand. As Google and user behavior has evolved over the past few years, the theme of ‘less is more‘ has never been so important as it is today. A website with too much clutter can become difficult to navigate, while a more stripped down look can appear more sleek and modern. This direction of minimal and simplified web design has been trending for a while now, and it’s important to take the potential benefits of this design philosophy seriously. Here are a few tips on how a more simple website design helps improve the user experience of your visitors. One of the first things to do when seeking improvement in your website design is to limit your website to the essentials. The process of trimming down the website can be a challenging one but is definitely a process worth some attention. A good rule of thumb to follow is the 80 – 20 rule, which states that 20% of what’s on a page should give 80% of its value. Consider what content on your pages are most essential and where you want your visitor’s attention to really be. Having enough pages on your website is important for SEO purposes, however, along the same lines as what’s been said above, you don’t want to go overboard. You want to make sure your website design is user-friendly, don’t make it too difficult for your visitors to navigate by giving them too many choices of where to click to find what they need, it might make them not want to return. One way to still have lots of pages and content while still keeping your web design clean and organized is to utilize categories and sub categories within your main site pages and blog to minimize the number of options a user is presented when first deciding where to go to find what they’re looking for. When a user loads any page your website, the first things they see is the area of your website usually referred to as “above the fold”. This refers specifically to the area of your website that appears in a user’s browser before they scroll down. This area often changes depending on the size of the browser window you view a website on. But being aware that this area is the first impression your visitors see, it’s best for a website’s design to carefully consider the first impression and type of content you want your visitors see at first glance. Although it’s been shown that most users naturally scroll down webpages to view additional content on websites, it’s important to consider what information, media, or call-to-action you want your visitors to see first. It could determine whether they stay or click-away. Don’t go crazy with too many different types of colors for your website design. When in doubt, find a small handful of colors and stick to those, anything else may become a distraction or complicate the user’s visual experience. Consult with a professional web & graphic designer when selecting your website’s color scheme and background elements. 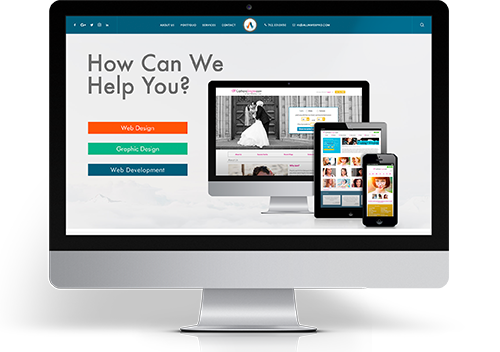 If you need a trusted, Las Vegas website design firm, look no further than All in Web Pro. Our experienced web and graphic design team will work with you to find your brand’s voice and help you translate it onto your webpages. If you are ready to take your brand to the next level, contact All in Web Pro today.